These rank among the best muffins I have ever had. And that is saying a lot because I have had a lot of muffins. I made a batch last weekend to take to a baby shower…but I ended up having to make another batch as the first twelve muffins were eaten within an a few hours of coming out of the oven. The recipe is from Gwyneth Paltrow’s cookbook It’s All Good. Say what you will about Gwyneth. Personally I love her. And although I have yet to make it out of the breakfast section, I love this cookbook. The advice contained in the forward is excellent, her pantry suggestions are easy and sensible and the recipes are simple and delicious! These muffins literally make you feel good. They make me feel like I imagine Gwyneth feels every day…healthy and happy! Mix together the flour, baking power, baking soda and salt. In another bowl, mash the bananas and then mix in the olive oil, maple syrup, almond milk and vanilla. Thoroughly combine the dry ingredients and the wet ingredients. 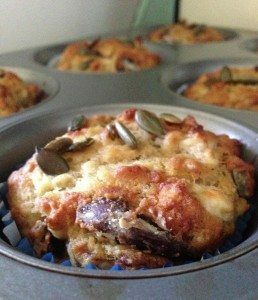 Toss the dates and pumpkin seeds in a tablespoon or so of flour…this keeps them from sinking to the bottom of the muffins and then fold them into the batter. Divide the batter into lined muffin tins. Sprinkle each muffin with a few pumpkin seeds. Bake at 400F/200C for 20 to 25 minutes. While the first batch is in the oven you might as well go ahead and mix up a second batch…they are that good!